Friday August 7th 1925 It rained part of the day. Laura feeling better. I worked on bead bag and read papers. A fine letter from Mrs O'Leary in Washington DC. After supper Mr Albers took us to cemetery and out to Browns to call. Saturday August 8th 1925 I knit on bag some. I had letter from Hattie. I wrote to her and Fannie who is not doing well at Colorado Springs. The girls busy with their work. warm. Sunday August 9th 1925 very warm. I went to M E Church alone in taxi. Lydia had dentist here doing work. Rested in afternoon and later had wonderful solo ride with The Woolfs. 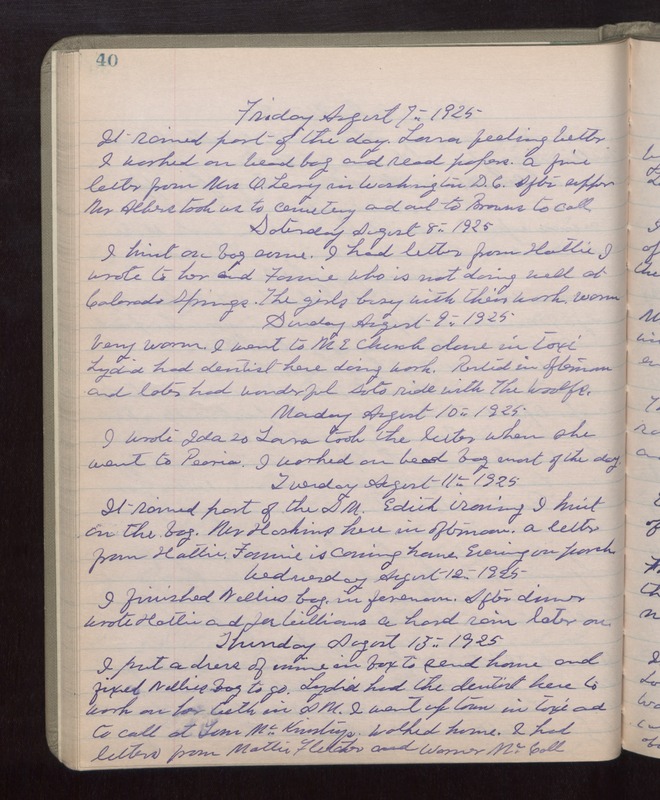 Monday August 10th 1925 I wrote Ida so Laura took the letter when she went to Peoria. I worked on bead bag most of the day. Tuesday August 11th 1925 It rained part of the AM. Edith ironing. I knit on the bag. Mr Haskins here in afternoon. A letter from Hattie. Fannie is coming home. Evening on porch. Wednesday August 12th 1925 I finished Nellies bag in forenoon. After dinner wrote Hattie and Joe Williams. A hard rain later on. Thursday August 13th 1925 I put a dress of mine in box to send home and fixed Nellies bag to go. Lydia had the dentist here to work on her teeth in AM. I went up town in taxi and to call at Tom McKinstrys. Walker home. I had letters from Mattie Fletcher and Warner McCall.